We’ve had good harvest weather this week. Wednesday afternoon I was out with Cody Weaver as they were picking his fields. This is first cotton he’s planted and managed. He’s done a very good job with this dryland, DP 1137. In Pavo, they received much more rain than the opposite side of the county. He did good on his PGR management and many times we walked fields counting stink bugs. Here is Cody on the module builder as I drove up. 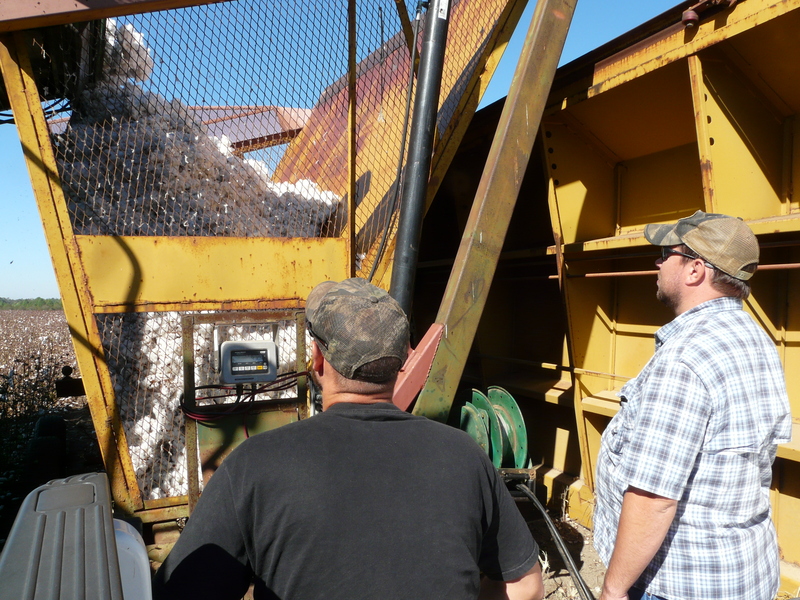 Cody let me pack some cotton until I just about picked up the module, flipped it over and ruined it all (not really). Grady County Ag Agent Brian Hayes wrote a good blog post about proper Soil Sampling on the Grady County blog he manages. Soil pH is the most important component of soil fertility since pH is the basis for what nutrients are available. Below is a graph of nutrient availability. All of our micronutrients become more available as pH decreases, but you lose most primary and secondary nutrients in this case. Somewhere between 5.5 to 6.5 a good range for all nutrients to be available. Of course some crops can withstand lower pH than others. For example, a common nutritional difficiency of pecans is “Rosette” which is zinc deficiency. On the contrary, peanuts are prone to a zinc toxicity. 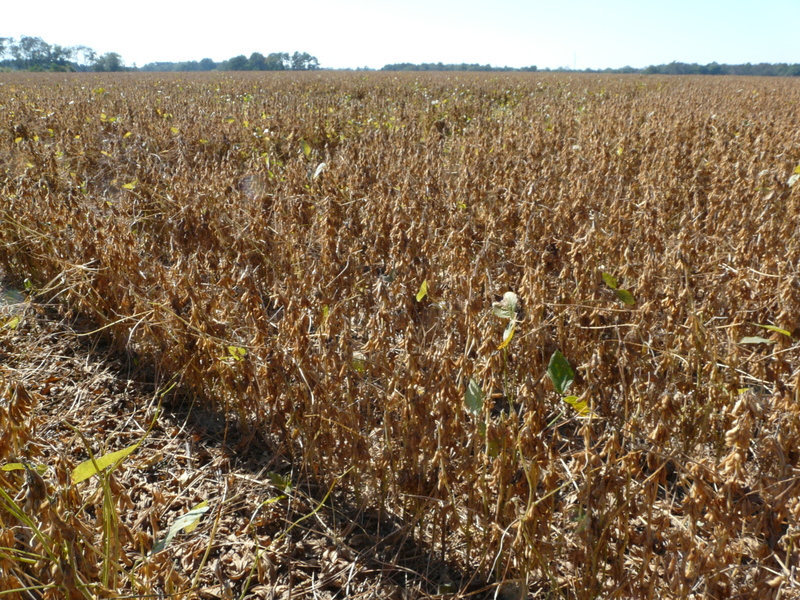 When pH falls, zinc becomes more available and a field of peanuts will show zinc toxicity (Below). The Georgia Clean Day set for this week in Brooks County Agriculture has been rescheduled and set by the GA Department of Agriculture to November 12th, 2014 from 9:00 a.m. – 3:00 p.m. Due to the change in collection date, they will be accepting additional product and extending the pre-registration time frame. There is no additional action required by participants that have submitted their information. If you still need to register for this event, refer to the link below for registration information and submit application information as soon as possible. Please note this change on your calendars and call our office at (229) 263-4103 if you have any questions. I was out with Jeff and Joseph Matthews on the east side of the county yesterday and they were gathering nuts from Desirable trees. 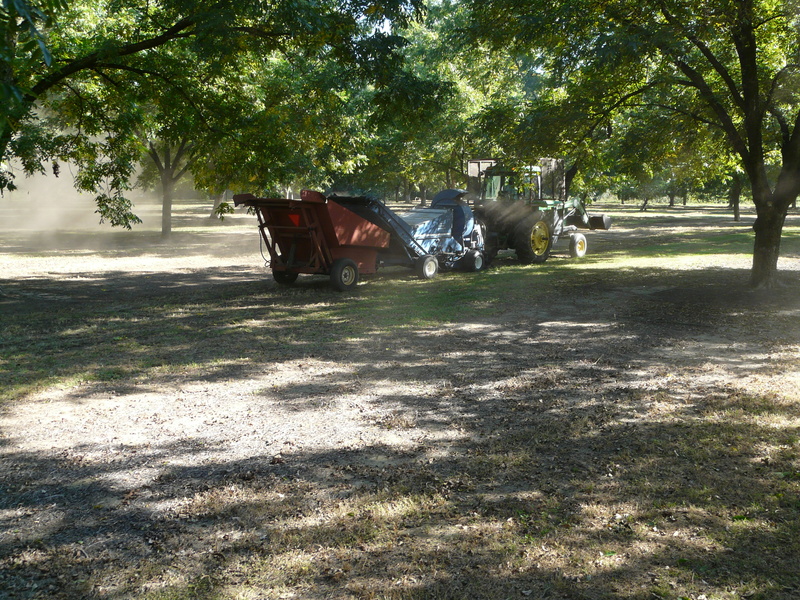 Mr. Jeff is driving the sweeper with flippers to gather nuts creating the windrows. Joseph is driving the harvester right behind him. Conditions are good for harvesting now since we are dry. 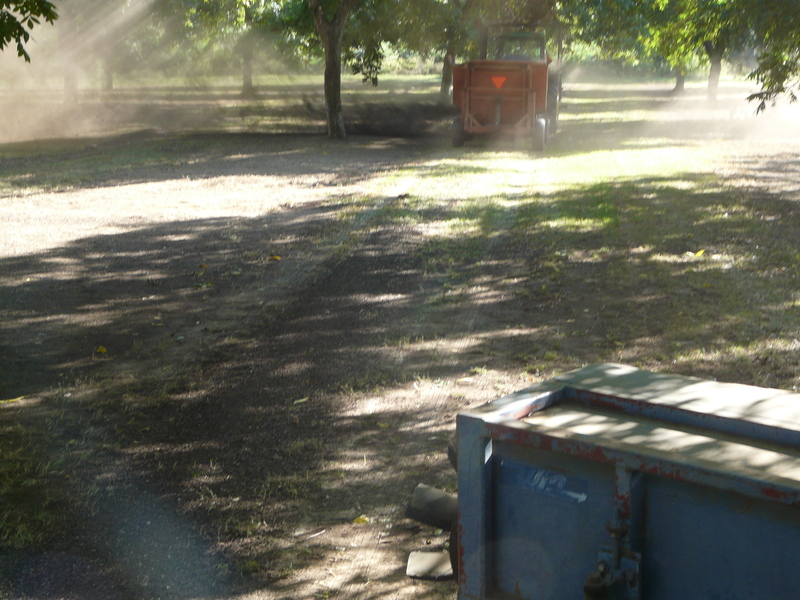 We are almost too dry as dust reduces vision between trees. These are the first nuts they are picking up, so they are mostly making sure equipment is set right. The harvester was digging into the ground a little and had to be adjusted and had to adjust air flow to keep harvester from loading up. They’ll go back to shaking Stuarts again next week and gathering those next. It’s a little early to know yield and grade numbers. But based upon early-season projections, there are lots of nuts are on the ground and being picked up. Kernel development looked good in most we cracked. Early nuts usually have decent prices. Prices are updated each Tuesday and Thursday throughout the pecan harvest season through the USDA Fed-State Market News Service. Here is a picture of early planted soybeans last Monday. Leaves are turning yellow and brown and falling off. The beans in the pods are at full maturity. Below is a photo of the same field taken yesterday. 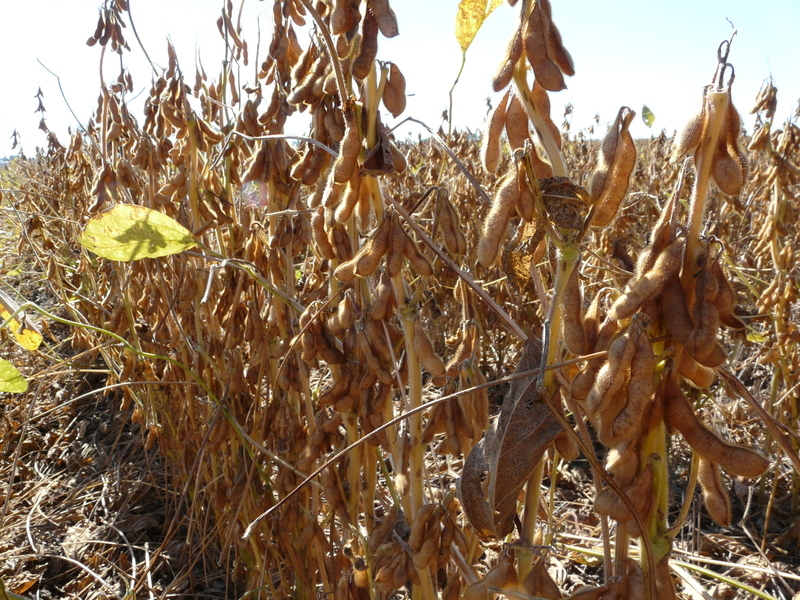 Seminole Ag Agent Rome Ethredge posted about irrigation termination on Seminole Crop E-News saying, You are generally safe to terminate irrigation if you have good soil moisture when the seeds fill the pods and the pods start to change to the yellow color in the top 4 nodes of the plant. 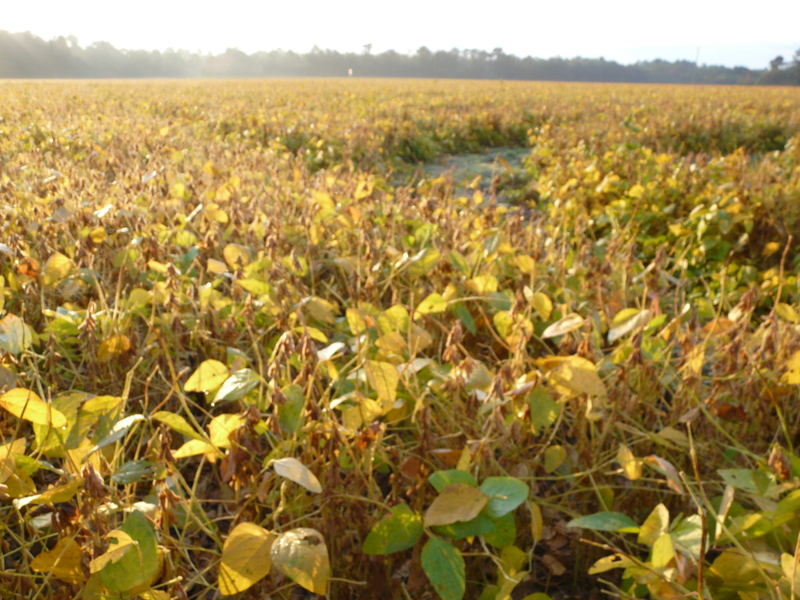 Mississippi State also has a good blog post concerning Soybean Irrigation Termination that goes into growth stage specifics. 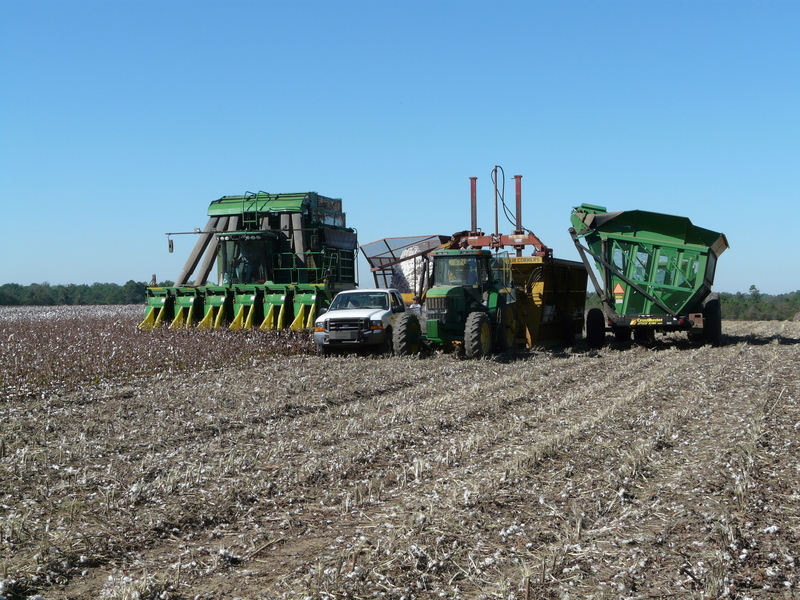 Weather is great these past couple of weeks for picking cotton in the field. We’ve been busy with trial harvest these last few weeks also. Brooks County Agents Stephanie Holliefield and Ben Shirley were picking their variety trial the week of the Expo. 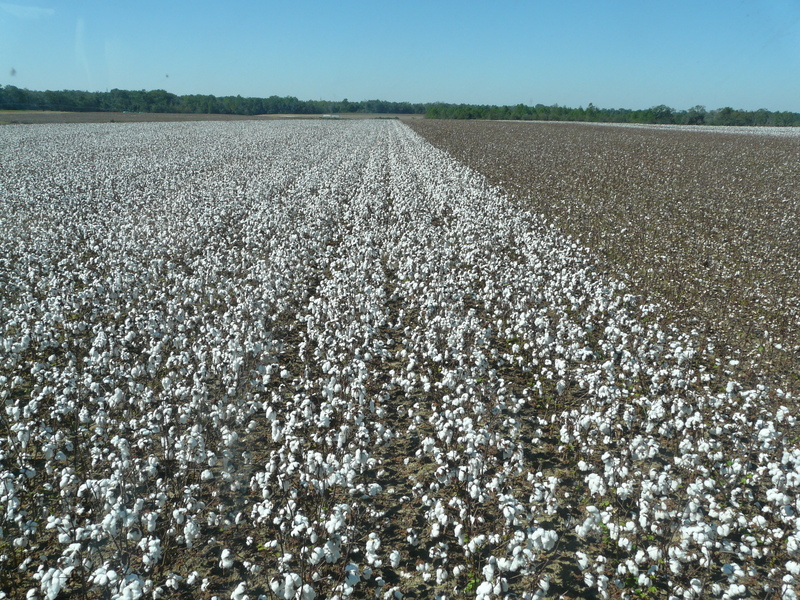 This is one of the statewide on-farm variety trials and was planted on the Thomas/Brooks line just east of Barwick. We’re in the driest part of the county here. Overall, irrigated cotton is okay. 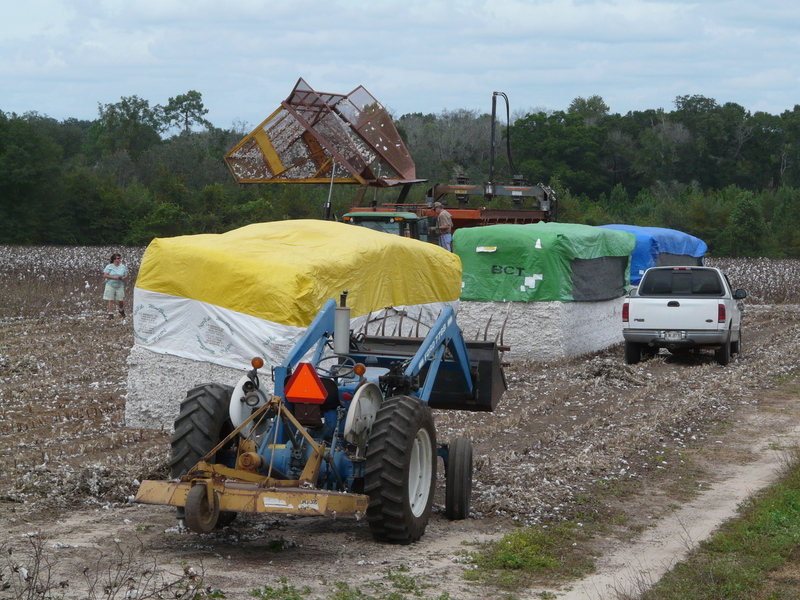 Some reports range 2 and up to 2.5 bales. Some growers are saying in spots were it looks like it would be 2 bales, they will pick a bale and a half instead. In this part of the county were we received much less rain, the ground was so dry and even under irrigation, plants were still stressed. 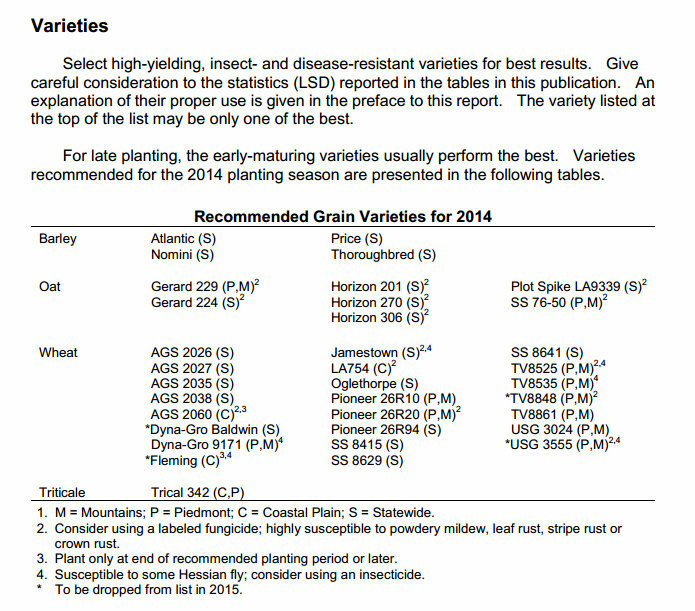 Non-irrigated yields here are not as well. Where rained moved through and irrigated fields were planted, yields are pretty good, however. The Small Grain Performance Tests on the statewide variety testing website have been completed, you can see here – 2014 Small Grain Performance Tests. 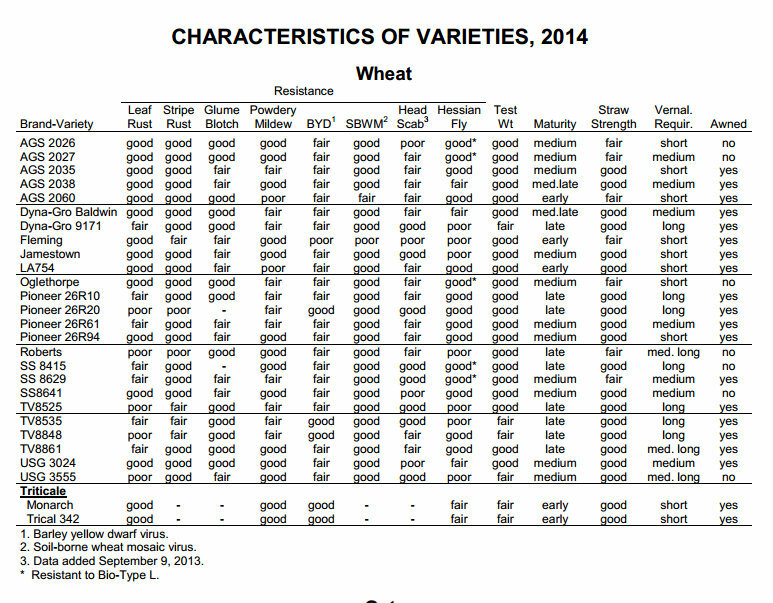 Variety characteristics presents great information that tells us a lot about disease and insects. This can also be found through that link also.